Medical and recreational marijuana dispensaries are driving the legal cannabis industry forward as a major player in creating jobs and bringing in revenue to states across the U.S.. Specifically in the customer service field, cannabis dispensaries help to employ the highest concentration of entry-level workers in the marijuana industry with budtending and marijuana dispensary receptionist jobs. Though dispensary receptionist jobs are less specialized and therefore, require fewer advanced prerequisites for getting hired than other managerial positions, this job is an important one. Working the front desk requires a diverse skillset and thorough knowledge of cannabis products and legislation. Marijuana dispensary receptionist jobs call for employees who can efficiently perform administrative office related tasks, as well as provide friendly customer service. As far as administrative duties are concerned, receptionists are key players in ensuring dispensaries operate in compliance with all state and municipal regulations. This includes facilitating basic security measures and organizing company data online. Receptionists are often responsible for processing and storing patient and customer identification to maintain organized records of customer interactions. It is likely that a dispensary receptionist is the first person you’ll see upon entering a marijuana shop. In addition to office work, receptionist jobs call for workers to greet and guide customers through the process of getting checked in. This includes answering any preliminary questions new and returning patients may have, queuing them in the waiting room and eventually sending them in to see a budtender when they are ready. Part of the appeal of working a marijuana dispensary receptionist job stems from the changing nature of daily tasks. As a receptionist, you will likely assist the dispensary manager with any daily duties that require attention. A receptionist is a jack of all trades who helps to keep the business running without a hitch, taking on the various challenges presented with each new workday. Often times, marijuana dispensary receptionist jobs double as budtending jobs. Especially in the case of smaller shops that require less staff, employees will likely cover both positions, depending on the shift. For this reason, it pays to have a background in the marijuana industry, or at least a wealth of knowledge of marijuana flower strains, as well as other cannabis products and consumption methods. Assisting with patient and customer selection of cannabis products and consumption methods. This is a budtender’s main and most important job, as it directly accounts for the satisfaction of the customer and the financial success of the dispensary. Budtenders must be on the cutting edge of cannabis culture, with fluency in all products in order to best suggest products to suit the individual desires of each customer. Budtenders are charged with facilitating a pleasant and informative experience for regular marijuana patients, as well as new users. Trimming marijuana and filling “pre-roll” joints. Some dispensaries require budtenders to have a background working hands-on with marijuana in order to prepare them for the process of efficiently preparing joints and other products for sale at a moment’s notice. Restocking and organizing product displays. As the competitive marijuana dispensary market continues to evolve, product options and aesthetic are of utmost importance to separate successful dispensaries from the pack. It’s important that budtenders maintain a well organized, attractive display that draws customers in, rather than turns them away in confusion. Cleaning the store. Budtenders and other staff must keep the store looking clean and welcoming. Updating store menus and Leafly profiles. Basic marketing is becoming a hallmark of budtender and marijuana dispensary receptionist jobs, involving basic social media posting and advertising, in order to reach a wider audience and keep the store current. Receptionist jobs allow for a great deal of mobility when accompanied by consistent work. Dispensary managers are looking to hire individuals they can trust with their information and product. If employees prove their efficacy in creating a positive work atmosphere, the opportunities for advancement are endless. When seeking a dispensary receptionist job, it helps to have experience in front desk and office work in a related field. Although there are some unique differences in the marijuana industry than others, marijuana dispensary receptionist jobs sustain similarities from one to the next and require a consistent set of skills. Customer service experience is a necessary qualification, since so much of the job involves communicating with patients in person, over the phone and via email. 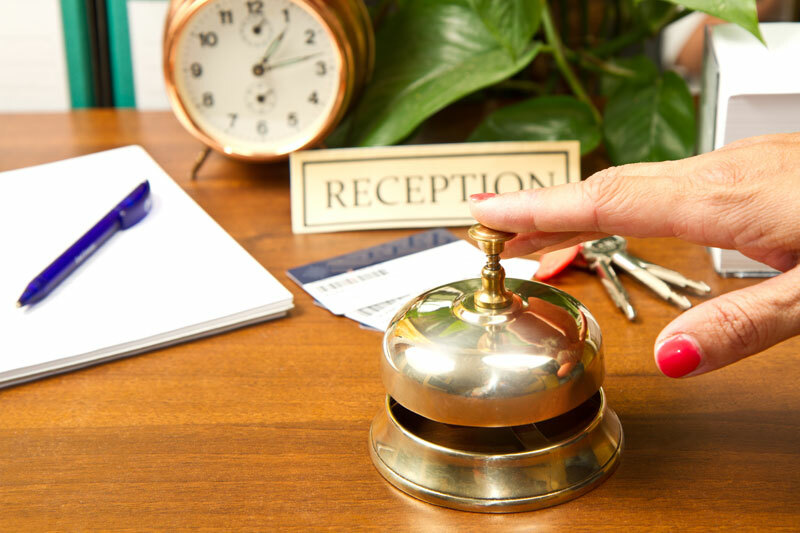 Receptionists must be able to provide compassionate, efficient service regardless of which mode of communication they are using. With this in mind, applicants for receptionist jobs must be comfortable with speaking on the phone and composing well written emails. Receptionists must also be proficient in basic word processing, spreadsheet and photo software in order to effectively perform data entry. Some jobs require employees to type a certain number of words per minute or have prior professional writing experience. While obtaining a dispensary receptionist job is a much desired position, there are always upsides and downsides to working any job. On the plus side, working as a receptionist is the best way to dip your toes into the water of the marijuana industry. Receptionist positions are more an entry-level marijuana job than most in the marijuana industry, it helps to give employees preliminary experience working in the business and offers a lot of opportunity for education and growth. Whereas other jobs (including budtending) usually require previous marijuana experience, receptionists generally can acquire a job without having worked in the industry before. One of the obvious benefits of working in a marijuana dispensary is the possibility for an employee discount. Though dispensaries are not authorized to give away cannabis products for free, they are allowed to offer employees reduced rates. For the cannabis connoisseur, this is a major perk. Though working any job in the marijuana industry can be exciting in and of itself, receptionist duties are not always the most stimulating of tasks. If you are working solely at the front desk, it may be frustrating not to work directly with cannabis products. Working at the desk can get boring at times, especially during lulls where there are few customers coming in and out of the shop. What some might consider to be the largest con associated with receptionists work is compensation. Receptionist wages start as low as minimum wage, but usually fall somewhere between 10-12 dollars per hour for starting wages. Depending on the dispensary, receptionists may get tip shares from budtenders, which helps increase the hourly wage. If you’ve read all the information above, conducted your own research and prepared the best application possible, you’re ready to apply for marijuana dispensary receptionist jobs. This task is easier said than done and requires perseverance to see through. One widely used option for finding dispensary work is applying online via job aggregation websites like Indeed or Craigslist. This route can be frustrating, however, because general job sites make it difficult to find legitimate, current positions that are open for hire. For this reason, professional marijuana job recruitment services like Canna Recruiter are helping to demystify and destigmatize the process of finding a cannabis career. It won’t come as a shock to hear that the most successful route for acquiring a marijuana dispensary receptionist job is knowing someone who works in a dispensary. While this option is not necessarily viable for everyone, it reinforces how seriously dispensary managers valuable trustworthy employees. By knowing someone who works at a shop, you are providing yourself with more credibility than someone who the manager has never seen before. Never fear, if you don’t have any personal connections with dispensary employees, there are other ways to boost your chances of winning an interview. For applicants that visit local dispensaries on a regular basis, this can be a key advantage. If you are a familiar face in a dispensary, feel free to inquire to receptionists and budtenders about finding a job. Though their shop may or may not be hiring, they likely have valuable wisdom and experience in finding a position. Ultimately, the greatest advice I can offer when seeking dispensary employment is to cover all of your basis. If applying online doesn’t work, bring your resume around to local shops in person. Be open to applying to a variety of shops–it may be time consuming, but it improves your chances. Securing a marijuana dispensary receptionist job is truly an accomplishment. Though at times, it may feel like you are starting your cannabis career on the ground floor, working as a receptionist is a great place to start. Not only will you be exposed to cannabis products, you will also gain access to a community of passionate marijuana consumers who share a common belief in cannabis. By surrounding yourself with these individuals in a professional setting, there is no way you won’t pick up lots of valuable industry knowledge along the way.